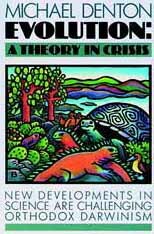 Evolution: A Theory in Crisis is a well-illustrated and referenced work. With remarkable clarity the author, an Australian medical doctor and biologist, documents why Darwinian theory of evolution is in serious trouble. Interesting chapters are devoted to such topics as homology, the fossil evidence, the origin of life and cladistics. Most important of all, the discussion of the latest discoveries of molecular biologists, of whom Michael Denton is one, shakes the very roots of orthodox Darwinism by showing that nature, in sum, appears to be profoundly discontinuous. ↑ Denton, Michael (1985). Evolution: A Theory in Crisis. Chevy Chase, MD: Adler & Adler. ISBN 0-917561-52-X. This page was last modified on 8 August 2014, at 19:46.